Organising every aspect of your life has a strangely therapeutic appeal. You either live a pedantically orderly life, or aspire to one. You love making lists: to-do lists, shopping lists, guest lists. When you can see ideas and plans laid out logically before you, you feel empowered, and even the most difficult tasks are do-able. Presented with mess and disorder, you turn into the (dreaded) procrastinator. You aspire to look put together at all times, but you are not one to fuss over your looks. Unless you’ve been invited to the Academy Awards (and even then), you would never be seen dressed up to the nines. Regardless of the occasion, you would rather wear comfortable shoes and look naturally you with just enough makeup to cover up your flaws. After all, true friends love you for your imperfections. When it comes to your wardrobe, you are all about signature pieces that express who you are and are made to last – the perfectly fitting jeans, a beautifully tailored blazer, the classic handbag. You might succumb to the momentary temptation of fun seasonal trends, but you treat these as cheap thrills rather than investments. Trends, what does that even mean? You have an appreciation for quality and the finer things, and receive little satisfaction from lesser substitutes. You would rather save up and spend $500 on a pair of simple Italian made pumps, rather than buy a $50 pair that ‘looks exactly the same’. In your mind, simply ‘looking luxe’ is boring. It’s the fine quality and craftsmanship that you fall in love with. You dislike waste with a passion. Your favourite designer makeup palettes can last you years, you grudgingly use up that final centimeter of pencil, and you stubbornly extract ‘cost for wear’ out of each and every piece of clothing – which often means getting creative with re-purposing or up-cycling pieces that have gone out of style. Cleaness and functionality appeals to you, rather than the overly decorative. So naturally, you gravitate towards clean lines, even textures and neutral colours. And you don’t understand things which do not have some kind of functionality. In your home, you value space above all. You would rather have no furniture and sit on the floor (Japanese styles) rather than fill every inch up with decorative paraphernalia. That is not to say your home is bland or devoid of personality. Far from it – as you choose all your possessions carefully, your home is an unmistakable extension of your personality. When it comes to money, you are no penny-pincher, but you don’t live large either. You would not hesitate to drop four digits on something you love, but you like to know you’re getting the best value. You are a bargain hunter at heart, and the % sign hold a special appeal. You don’t deal well with clutter, so routine spring cleaning is a hobby rather than a chore. You love the feeling of clearing out the superfluous, simplifying your life and reassessing your priorities. Your aversion to clutter extends to the people in your life. You like to surround yourself with only people who matter most to you. Therefore the Facebook friend list is not immune to an occasional spring clean either! So how many of these are definitely you? great list. i am not a minimalist but there are some qualities I aspire to have. Thanks for reading! And I’m completely with you on that! Really loved reading this! A fresh and different take on what being a minimalist is about and I have to say I agree with all of it. Aw thanks so much for reading! I’m such a huge fan of yours, so I’m so stoked that you came to visit :). I also don’t define myself as doing everything in a minimalist way, and I don’t think I dress completely minimal most of the time (I wear so much animal print!). But I think that there is a kind of attitude that people who gravitate towards minimalism have, and it’s just a preference for simplicity and cleaness in every aspect of our lives. Yes that’s me!! Loved this post thankyou. haha I knew it would be you! I think you are definitely more of a true minimalist than I am. Great read! I never considered being a minimalist is already a (some kind of) label. 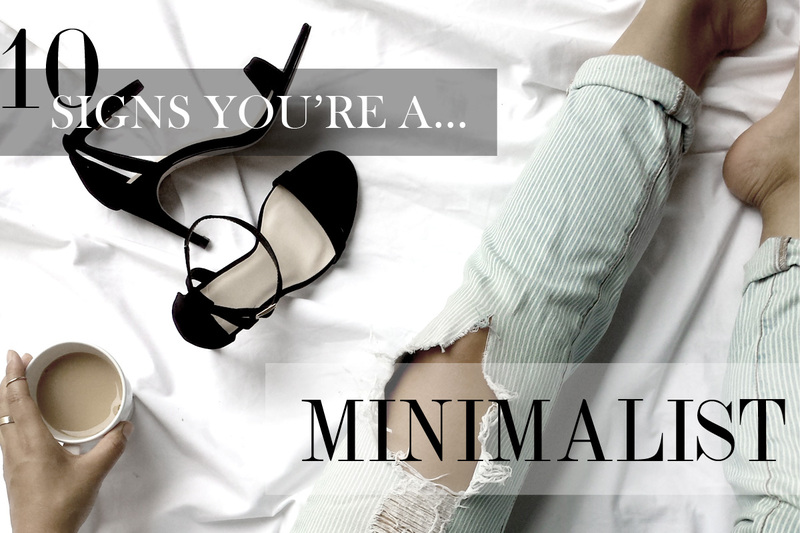 Looks like you might be a minimalist too! I don’t know if it’s a thing, but I’m definitely working on making it one! By the way, which were the ones you didn’t agree with? Thank you so much for reading my blog, Amanda! I hope I can continue to create useful content that helps you achieve the perfect minimalist life and style!